3/4" Sterling Silver Miraculous Medal Made in the USA. The Traditional Oval Shape with Lettered Border is Adorned with finely detailed Blessed Mother Mary with rays coming out of her extended hands. The Reverse Side of the Medal Portrays an "M" with a Cross on the top and the "Sacred Hearts" underneath surrounded by Twelve Stars. A 16" Rhodium Plated Curb Chain is included with a Deluxe Velour Gift Box. This Sterling Silver Miraculous Medal is made in the USA. 1 7/8" Sterling Silver Crucifix with 24" Chain. This 1 7/8" Sterling Silver Crucifix with 24" Chain is made in the USA. 1 1/4" Sterling Silver St. Benedict Crucifix with 18" Chain. 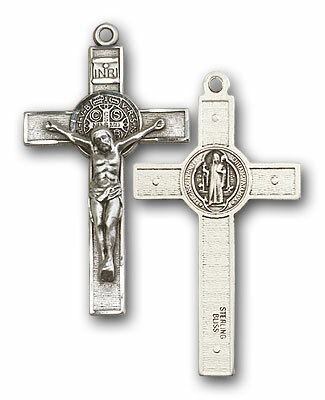 This 1 1/4" Sterling Silver St. Benedict Crucifix with 18" Chain is made in the USA. 1 5/8" Sterling Silver St. Benedict Crucifix with 18" Chain. 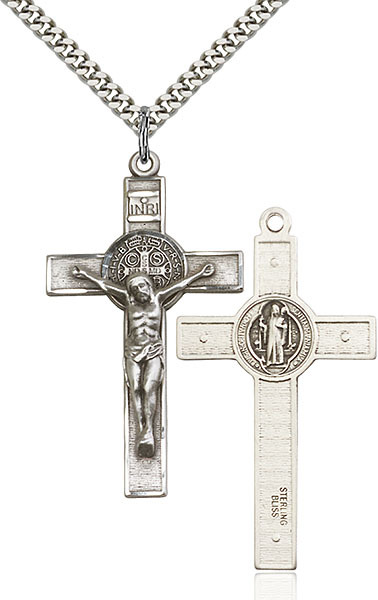 This 1 5/8" Sterling Silver St. Benedict Crucifix with 18" Chain is made in the USA. While wearing this Blessing Bracelet may you be blessed by Mary’s loving protection and preserved in the grace of her Son. Handwoven in Medjugorje, Bosnia and Herzegovina each bracelet is made using 10 silver dipped Miraculous Mary Medals on a cord and includes a “blessed” tag. Medals made in Italy. This Blessing Bracelet comes on a card which tells the story of the Miraculous Medal.